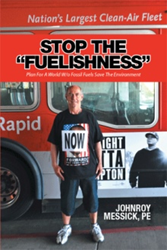 Johnroy Messick, PE returns to the publishing scene with the release of “Stop the “Fuelishness”” (published by Xlibris on December 2015), a book addressing the core issues of the depletion of fossil fuels and what people can do to save the planet. To purchase and know more about the book, readers can visit https://www.amazon.com/STOP-FUELISHNESS-World-Fossil-Environment/dp/1514431076. Set for a new marketing campaign, the book is meant to provide a solution to stop the “fuelishness” of depleting the earth’s fossil fuel while adding pollutants to the atmosphere and, therefore, save the planet. Messick stresses the positive results of withdrawing off the already diminishing fossil fuels, including increasing the availability of fossil fuels; significantly reducing carbon emissions; providing cheap electricity; and saving lives from fossil fuel emissions and traffic accidents. He then presents an alternative source, which he believes can solve the issues brought by fossil fuel use – nuclear power. Additionally, the book contains short stories of Messick’s poor and harsh childhood in a humorous way. Johnroy Messick, PE was born in Virginia in 1944. He was one of the top three graduates from Auburn University in 1968 with a Bachelorette of Science in chemical engineering while achieving the honors of Tau Beta Pi, engineering honorary; Phi Beta Kappa for the top academic graduates; and Phi Lambda Upsilon in chemistry honorary (president for one year). Messick went on to obtain his license as professional engineer in Ohio and five other states. At the age of 38, he was elected president of the Ohio Association of Consulting Engineers and was recognized as the youngest project manager and technology vice president. As an engineer, he holds three patents, with two of these patents in the energy area. He also obtained a master’s plumbing license in Ohio, and purchased and operated a plumbing franchise. Additionally, Messick was a licensed pilot in single engine aircraft under both Instrument Flight Rules (IFR) and Visual Flight Rules (VFR). He has two daughters, a son and a granddaughter. Messick had a second massive stroke immediately after completing this book.